Ugh. The appeal of this fantastically titled book with a quirky cover design pretty much begins and ends with said title and cover design. This is boring and frankly surprisingly ordinary given the dramatic nature of the premise, all rife with possibility and comedy. Ruby Oliver is at the end of her rope and in denial about it after a series of unfortunate (though not particularly unusual) events happen to her causing her to lose her boyfriend and her social life and become temporarily a social outcast. So her overprotective parents – volatile comedian mother and abstracted plant-obsessed father – send her off to therapy. 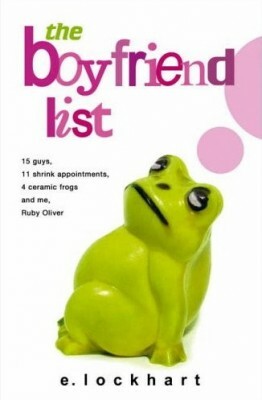 Where her therapist instructs her to make a list of all the boys she’s ever liked and thus Ruby’s story (such as it is) unfolds over the course of 11 therapy sessions. Couple problems: Ruby’s problems are not at unusual – her ex dumps her for another girl, she attempts to get him back, has lots of drama with her girlfriends, etc – and therefore not innately interesting, though really good writing could have covered that – and two, her “boyfriend” stories are mostly rather dull. Half the boys on the list she had a brief and pointless crush on; there’s only a handful in which the history is genuinely interesting. Her childhood friend, her high school boyfriend, and the boy she encounters toward the very end of the novel are the only three interesting ones, and none of these three is fully developed. Her relationship with her current/high school boyfriend is compelling and achingly real at times, but it’s given neither full development nor a resolution, it just sort of peters out. And while this is reflective of real life sometimes, it wasn’t replaced with any other element. She has a few brief exchanges with the interesting, sarcastic, and refreshingly grown-up Noel toward the end, but he simply fades from her life. E Lockhart in the final act reaches toward a growing-up story of catharsis and independence with a teen girl leaving the drama of high school behind and embracing her own identity – but tells this rather than shows it, and it simply falls flat. Give this a miss – John Green writes a thousand times more tenderly and eloquently and comically about the obsessive, circular, magical period of discovery that is adolescence. P.S. Add me on Goodreads! That’s disappointing. The premises makes it sound like a fun quirky novel, but it seems like that isn’t the case. I think I’ll still read it though, if only because the cover is so cute. It wasn’t bad, just mediocre. Hopefully you enjoy more than I did. I didn’t like it either. I had to read it for a YA writer’s class. The teacher was a personal friend of the author and most of the class ate it up.